Yesterday, Illinois paved the way to become the 15th state to legalize same-gender marriage. I believe those who voted for marriage equality made the right decision, and I’m excited that we are moving in this direction in Illinois. I know that there are many good people who would disagree with me on this, but I’m grateful for what was decided yesterday. I’ve been thinking about marriage recently. Last week I was able to attend the Covenant Network National Conference at Fourth Presbyterian Church. I saw a lot of good friends, and heard some wonderful lectures and participated in some discussions. I particularly appreciated Stacy Johnson’s talk on marriage. I took some sketchnotes during the conversation, which you can see below. Johnson talked about how he had recently come out with a 2nd edition of his book, A Time to Embrace, and how the language in it was very different from the 1st edition. When the 1st edition came out, there was only one state that had legalized gay marriage, and now we are up to 15. Things are changing, and they are changing quickly. And it sounded to me like Johnson had changed his tune about what was at stake for the church in this conversation. I think Johnson, and many others, in the past, have wanted to move toward full acceptance of same-gender marriage, but had hoped that it would not cause a schism in the church. 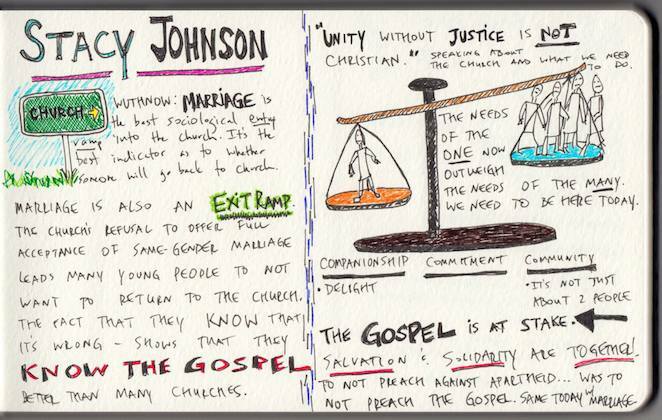 And my interpretation of Johnson’s talk last week was that he now believes the church needs to work toward justice for all, regardless of what happens to the church. And for Johnson, it’s really the gospel that is at stake here. He said that in South Africa, it was said that to not preach against apartheid, was to not preach the gospel. And he believes that to be the situation that the church is in today. If we don’t preach justice and equality for all, if we don’t preach that all are created in God’s image, and all deserve the right to love whom they love, then we are not preaching the gospel. Johnson also talked about young adults and the church, citing the work of Princeton University’s Robert Wuthnow (I emailed him for the exact link to the book/article/study but haven’t heard back yet). Wuthnow has always been doing work with young adults and the church, and for the longest time, we believed that young people stepped away from the church, only to return later when they got married or had kids. But that isn’t happening as much anymore. One of the reasons, is same-gender marriage. And I’ve heard this before. Young adults continue to view the church as irrelevant when it cannot see that the world is changing, that full-acceptance of same-gender marriage is coming and it’s only a matter of time, and that when Christians speak out against it, and when churches plod along on their own discernment on the issue, it makes the church seem like a place that just doesn’t get it. For most young adults, same-gender marriage is a no-brainer, it’s a non-issue. And when they see churches and denominations spending so much of our time discussing, studying, debating, fighting for and fighting against same-gender marriage…it is obviously a turn-off, and one reason that people are turning away from the church (or simply becoming ambivalent and not returning to the church). The nuance of this argument (which I agree with) is that churches shouldn’t fight for marriage equality just to get young adults into church. That’s not the reason. And that’s not a guaranteed result. Just because your church is a More Light church or a Covenant Network church, and just because you’ve got a rainbow flag flying on the front of your building, that doesn’t mean that all of a sudden LGBT and straight young adults are going to come flocking to your churches. But I think it certainly would make some young people think again about getting involved in a church that more closely aligns with their own beliefs and values. And at least as of last February, 81% of young adults (ages 18-29) support marriage equality. Things are going to be interesting for Presbyterians in Detroit in 2014. That’s when we’ll hold the next General Assembly, and I can only imagine there are going to be a ton of overtures trying, again, to change the definition of marriage. I know that at least two of them are coming from the Presbytery of Chicago, one from Fourth Presbyterian Church. I am assuming that with all of what has happened this past year, with a lot of churches leaving the PC(USA) for the ECO and EPC and with how close the vote was last year, that we will see the change happen this summer. Of course, that will cause even more churches to leave and pull out, but I’m with Johnson on this one. I don’t know that so many will pull out of the denomination that it will be worth calling it a “schism” but many more will certainly pull out, and we just need to be okay with that. They will go on to places that they feel more comfortable with, and we can go on doing ministry, marrying whoever wants to be married. I know that there is a lot of work to be done between now and next June, and I don’t want to be naïve and just think that it’s a given. But I think we have a great opportunity next summer for the denomination to take a stand for justice, for equality and for the message of grace and inclusion that we find in the gospel, and vote to change the definition of marriage.